Research shows that a fresh fragrance is essential to the experience of a clean toilet, room, or venue. 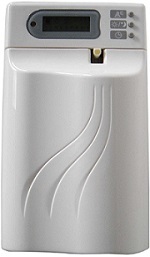 TCS fulfills this vital requirement with a broad assortment of air freshener dispensers and refills. WE DO NOT HAVE OTHER BRANCHES OR SALES OFFICES. Email your request. We respond to quote requests that are emailed - we do not quote on the phone, neither do we take orders over the phone. The revolutionary LCD automatic air freshener dispenser and air freshener refills provide the most effective, best cost in use odour neutralizing available today. If you are looking for something to keep the air in your environment fresh, clean smelling, and want to use the best in state-of-the-art technology, then you might want to consider a TCS Automatic Air Freshener Dispenser. These units are widely regarded as the best available and they are not only appropriate for use in upscale homes, but they do a great job in high-end establishments such as restaurants, hotels and clubs.